India's External Affairs Minister Sushma Swaraj on Wednesday again raised India's concerns over H-1B visa with the United States Secretary of State, Rex Tillerson. 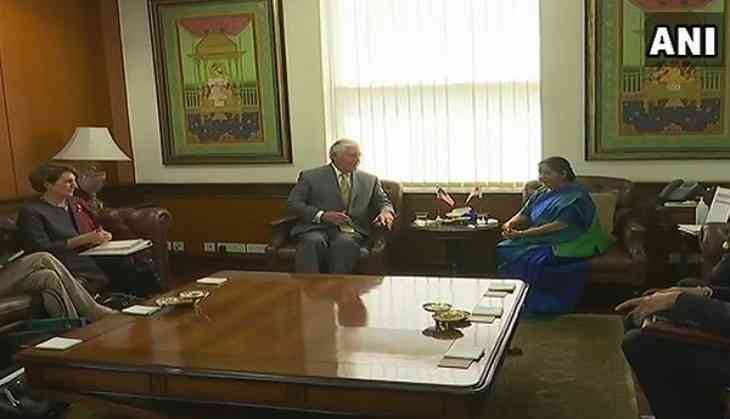 Speaking at a joint press conference along with Tillerson following delegation-level talks, Swaraj said: "Discussed H-1B visa issue and requested US Secretary of State Rex Tillerson not to take action that may adversely impact Indians." "There has been no change yet. There are proposals. Efforts are on to ensure the bill doesn't get passed in the Congress," Swaraj said. Earlier in September, the External Affairs Minister had raised the issue of H-1B visa with Tillerson during a meeting held on the sidelines of United Nations General Assembly in New York. Tillerson arrived in India on a two-day visit last evening. The U.S. Secretary of State's visit to India is part of his five-nation tour that includes Pakistan, Saudi Arabia, Qatar, and Switzerland alongside. The H-1B is a visa in the United States under the Immigration and Nationality Act, section 101(a)(15)(H) which allows U.S. employers to employ foreign workers in specialty occupations.